You are here: Home / Journal / 2015 / What’s This Tiny House Movement? A classic Tumbleweed tiny house. Image via Flickr. At Small House Building we’ve tended to focus on the “small” home — dwellings of about 500-1000 ft2, and not so much the “tiny” home. It’s time to add some more content in that area. If you’ve found our site you’ve no doubt been searching for information on building or living in a tiny house. There’s a lot of information on our site on going through every step of building your own house. Much of the framing, electrical, and plumbing will be the same as it applies to a tiny house on wheels. But, it’s the foundation that’s a bit different. 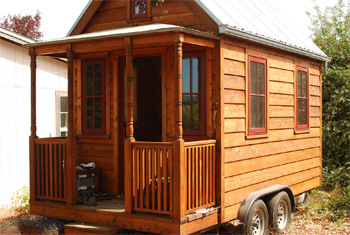 Building a tiny dwelling on top of a heavy duty trailer has to be handled very carefully. But, I’m getting ahead of myself. Where, exactly did this thirst for information on tiny houses start? Even though tiny houses are becoming part of the mainstream culture in the last few years, the idea of building small and cheaply isn’t new. There has always been, and always will be, a segment of any culture that wants to reduce their housing costs as much as possible. Some by choice, some not. 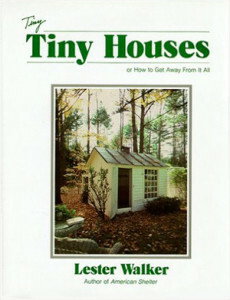 Tiny Tiny Houses came out in 1987. And don’t forget the ages-old admiration for the getaway hermitage or cottage. A place to meditate, pray, write, or contemplate away from the masses. These kind of tiny dwellings have been around for centuries. But, in our modern times, the defining event that likely spurred on the current interest in tiny houses was the market and housing crash of 2008. With so much economic devastation people had a chance to step back and really assess the role of material possessions in their lives. Gradually a shift in attitude to simpler, smaller, and less stuff emerged. Even though a tiny house on wheels can be built onto a trailer to get around residential building codes (specifically the minimum square footage), it then becomes categorized as a Recreational Vehicle. And many municipalities have restrictions on parking, much less living in, an RV. The solution for most people is to find land where a tiny house can be hidden. If you don’t attract attention, then who is there to complain to the authorities? And because they don’t qualify as a “mobile home” they can’t be legally parked in a “mobile home park”, where a resident could gain easy access to water, sewer, and electricity. The bright spot is that there are a few places around the U.S. where tiny house building codes are relaxing. It takes a lot of forward thinking on the part of city councils and townships to make this happen. One place is in Spur, Texas. Open source image of tiny house from Fair Companies.